If you came here looking for Ye Olde(r) Coulter's Smithing Home then here's the link to that, which is some good background on us. As sometimes happens, our main thrust has changed, but we didn't forget where we came from, either. The links to home there go to the old home page, so use the back button to return here. The rest of this is just me yakking -- the forums have other people's input and viewpoints -- much more better! Under construction. Duh, always! We are focusing (literally, in this case) on Fusion these days, so the site was changed to reflect that, and to post any interesting new results. Just to whet your appetite, here is a picture from a recent run where we did deuterium on deuterium fusion with great success. 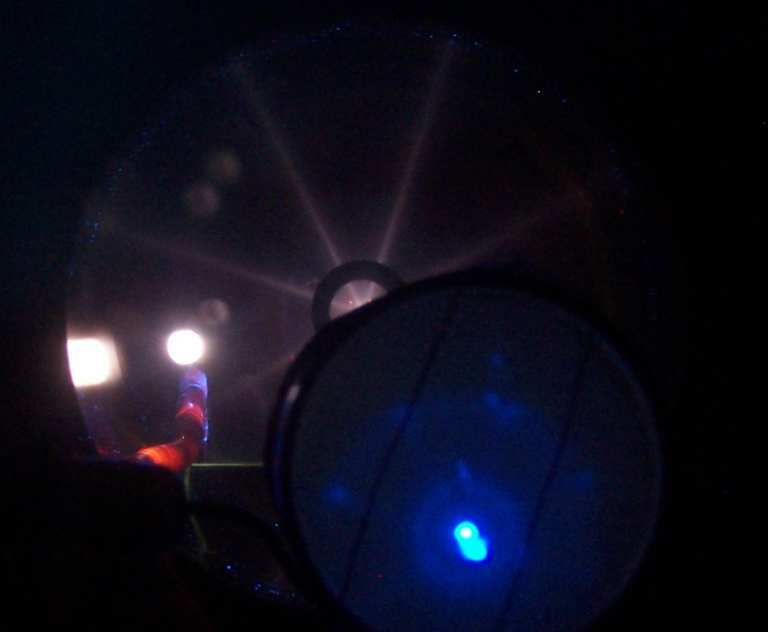 In the foreground, the blue stuff is the image on a pinhole charged particle-X ray camera we built and mounted on a wiggle stick in the tank so we could get a clue what was going on. The violet rays emanate from the fusor cylindrical grid, the focus of which is hidden by the charged particle camera; otherwise that would be the brightest dot in the picture, and the camera would have under-exposed the rest. The bright dot on the left is looking into the end of the microwave/ECR ion source we designed. The red glow in the lower left is the alumina insulation on a wire going up to the ion source to provide the ion extraction field. It seems alumina is a good red phoshpor if you bang on it hard enough with charged particles and X-Rays. Especially before you sputter titanium onto it by accident. We decided to take a page and some learning from the world of electron vacuum devices where quite a lot of charged particle physics has been worked out to the Nth degree and put into practice. In the fusion/plasma world we seem to be alone in this, as if all that good work had never happened. Not only is that a shameful waste, but using the techniques developed way back then, we're doing better than most others doing Farsnworth/Hirsch class fusors as a result. This picture was actually taken under less than ideal conditions for efficient fusion, since when in that mode, there's not much light lost to take a picture with. This run, however produced roughly 1.5 million neutrons per second with a mere 5 watts average input, in a pulsed mode. During that there is very little light to see in there, other than from the deliberate phosphors. The pretty rays, and in fact any photons, visible or not (most are X rays), are indications of loss, and if we could do this with no electrons or neutrals present, we probably would. Although the moniker Focus Fusion has already been taken by another outfit with another very different approach, focus is what we are going for here, which could be otherwise stated as the creation of a high density area in space-time of hot, directed fuel atoms, so this is NOT thermo-nuclear, rather, it is coherent, we are doing all we can to prevent thermalization here. This takes subtlety, not brute force, and too much space charge or fuel spoils it, something I've been unable to sucessfully communicate to others doing Farnsworth fusors, it seems. We are of course in touch with both groups, and we share results, and all have been helpful. Not everyone working on this is either a charlatan or cad -- or a simple waste of government (your!) money. Just many of them. Here is our main setup and crew, from left to right, Bill Fain, Dave Knight, and myself, Doug Coulter. 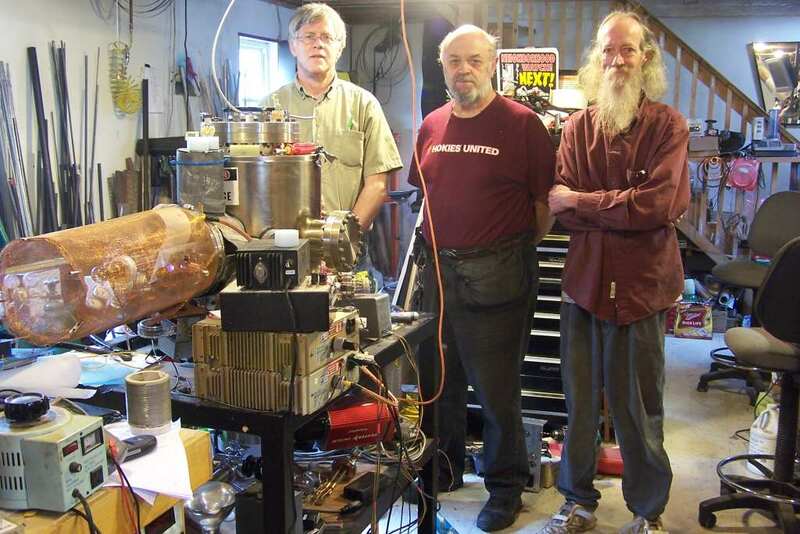 This was taken just after our first extremely sucessful run, one that got us into "the neutron club" on the Fusor Forum, which is a collection of self described amateur Fusor enthusiasts. I say so-called because at least some of the people there are amateur in self-deprecation only, and we are most grateful for all the help and information this group has provided us. I contribute regularly to this forum myself, or disrupt it, depending on who is asked, I suppose. That forum is a fantastic place to learn from, and do go visit and use the search function there to find out about all the work that has been done, all funded by the people doing it. This is the shop in which we do this, and as you may be able to tell from the picture, we're already on alternative energy. When we get a break in the weather, we have enough more solar PV panels on hand to finish covering the roof, which will help us have less need of a generator during bad weather periods. 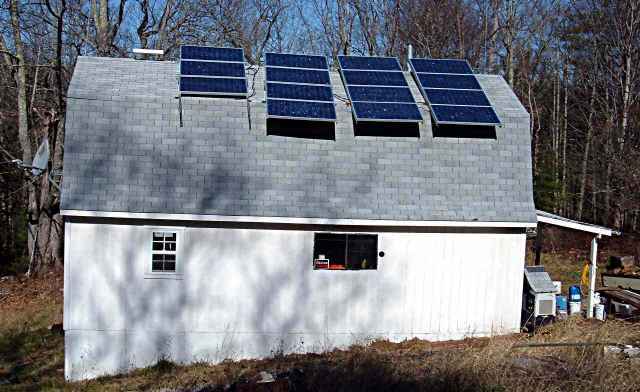 This has been a good deal over the decades during which we have been off the grid, and the "green" aspect is not even the main thing. How about no bills from the aptly named power company? Think of the power they have over your life! Lower taxes due to not being on the grid and therefore "disadvantaged and worthless". Bragging rights of course do figure in. And, this happens to be one of the most beautiful places to live on the planet, the sort of place others pay to go and visit to experience more or less unspoiled nature, though YMMV. This is one of two solar systems on our campus that run a total of 4 buildings here, and which are set up to be able to back one another up. The shop pictured was purpose-built to support this project, and contains a machine shop, chemistry and electroplating labs, electronics lab, and various other physics/science goodies. Another building holds the computer hardware/software stuff, mostly (computers follow me everywhere), another is living quarters, and the last is for high quality storage. Out here in the boonies living is cheap, which is a major contributer to being able to do things like this. Our entire working group is more or less retired from sucessful careers in technical fields, and this is what we call our job now. And there is some grunt work involved, that 99% perspiration Edison mentioned, but it seems well worth it, to us. OK, enough appetite-whetting for now, let's get on to the real stuff. The links below are to various progress reports on what we've been up to for the last couple of years, newest first. We hope to be adding a message board and FTP server for documents real soon now as well. Hope to see you there! Some things we bought, some we built as seemed good at the time. This is a page for things we built that you may want to build too. DIY Construction projects Major Toy Alert! Data from runs in our lab. Comments and raw data.